Why Gold-Usd Correlation is of Much Significance to Currency Trader? Gold-Usd correlation is yet another significant forex market indicator. Gold, denominated in terms of the U.S. dollars, directly impact price movement of EUR/USD. Due to its relative rarity and historical significances, it is considered as one of the most treasured metal in the world. Gold serves as proxy for value and is widely traded in every nook and corner of the world from peasants in the hinterland of Himalayas to small potato vendors to corporations, large multi-national banks and central banks of every nations. The peasants in the Himalayas who buy gold might merely have purpose of gifts or ornamental purpose. Small potato vendors who purchases gold might serve them as a vehicle for monetary exchange in his/her potato business. Large corporations and multi-national banks on the other hand trade gold for hedging purposes. The central banks, on the other hand, trade gold with purpose to manipulate the monetary value of their respective nations. Major central banks like the Fed in the U.S., and the E.C.B in the Euro zone both hold vast gold reserves. The ECB in particularly is notoriously recognized for dumping many tonnes of their gold reserve on the market in order to stabilize the value of the Euro against the U.S. dollar. The bottom line is: whatever might be the purpose behind gold transaction, gold-Usd correlation is a strong correlation that can potentially serve currency trader an invaluable cues. In figure 1. Gold-Usd exhibits near perfect mirror image. From the graph, it is pronounced that gold and the U.S. dollar share a strong negative correlation, i.e. when gold price is up dollar is down and vice versa. This strong negative correlation between dollar and gold makes gold as an ultimate forex hedging tool. Traders and investors can buy gold in order to hedge against the U.S. dollar weakness. Let's see if I can make this gold-Usd correlation make more sense. When gold is purchased, the U.S. dollar is sold. Selling dollar will naturally devalue the currency as we have more supply of dollar. When gold is purchased, it's price rises because of demand for gold. So if you notice gold making lower lows then anticipate dollar gains and vice versa. Historically speaking, strong negative gold-Usd correlation has existed in near perfect as investors often hedge against the U.S. dollar weakness by buying gold. However, don't take my analysis on this correlation at face value. Even this strong correlation breaks down during massive economic crisis. Let's laser focus onto the figure 1. to advance further analysis onto this anomalous behavior. At the center of graph in figure 1. lies an inflection point, a point on a chart that marks the beginning of a significant move, either up or down. 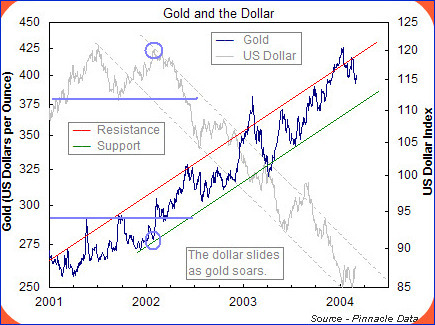 Notice at this inflection point that both the gold and dollar make a sharp peak to the north side. This inflection point marks the break down of gold-Usd correlation that I've been attempting to preach. Allowing me to preach more onto this anomalous behavior. During major economic crisis, gold is a safer haven than the U.S. dollars from an American's perspective. On the other hand, the rest of the world considers the U.S. dollar as the safer haven. Specifically, foreign investors flock to bid up the U.S. government bonds, also known as Treasury bonds, Treasury notes or Treasury bills (T-bills). Any debt issued by Uncle Sam is considered extremely safe. So foreign investors see inherent safety in investing in Treasury notes behind the attractive yields on their capital investment. Due to this foreign capital flows in times of massive financial crisis, the U.S.dollar gains considerably in comparison to all foreign currencies. As a result both the U.S. dollars and gold strengthens during a mass flight to safety. Once the relative economic crisis settles across the globe, the correlation gold up dollar down comes into effect again. By now, I hope you see light in the tunnel why this dollar-gold correlation is of greater significance. Think you see light in the tunnel why this Gold-Usd-Correlation is of greater significance?